The National Mall has 8 major national memorials, plus the White House and the US Capitol. It is at least 6 miles to walk around the entire National Mall and see all of these highlights. 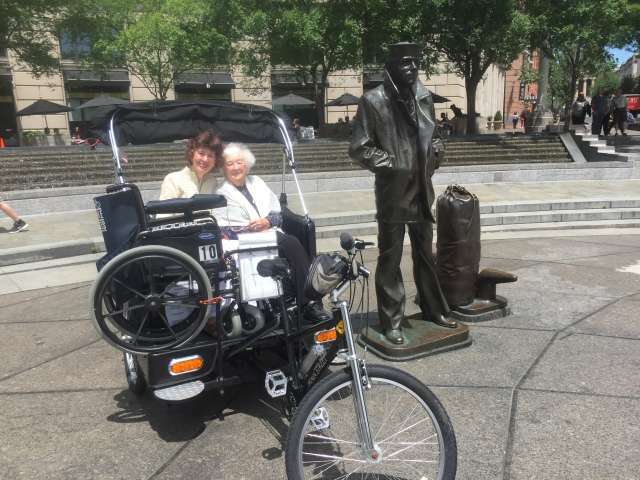 A private tour by pedicab is ideal for folks with limited mobility. 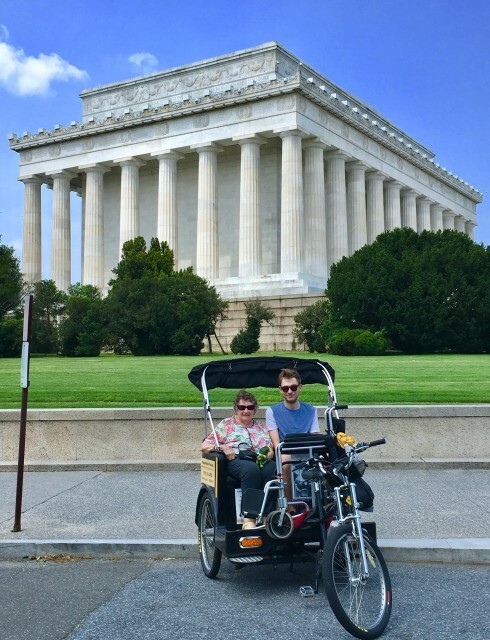 If you don't have the time or ability to get up close and see the sites, a guided pedicab tour is the best and easiest way to see everything. 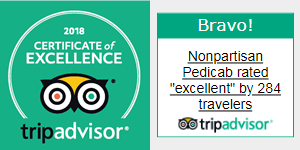 "Excellent experience with my elderly mom. 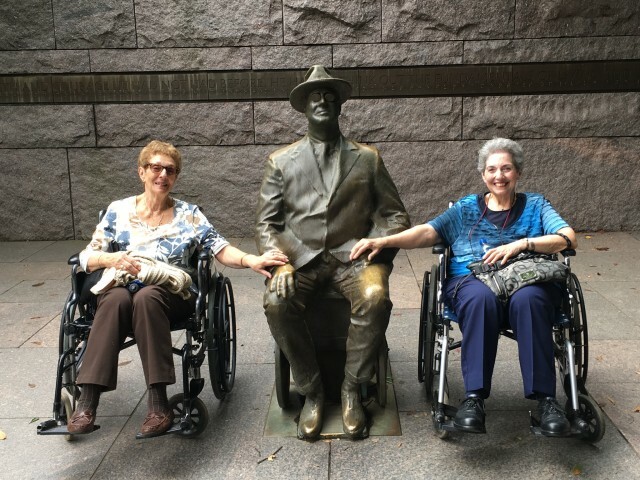 She was able to see monuments up close and Robert Hart, our wonderful guide, was extremely knowledgeable on top of being friendly, flexible, patient and considerate." 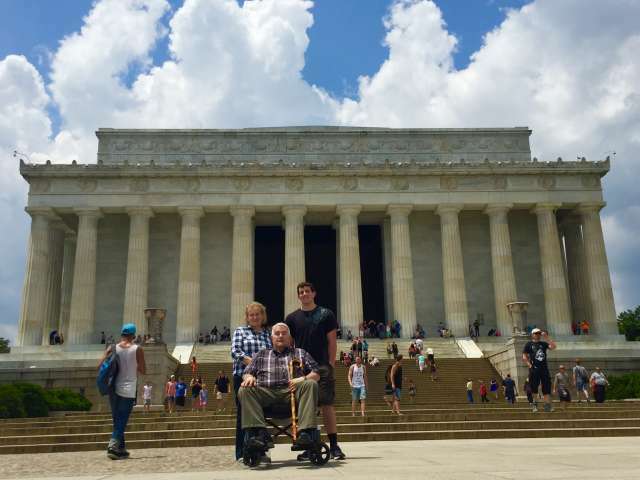 How can disabled or handicapped people tour all the memorials on the National Mall? Obviously, disabled and handicapped visitors to the National Mall in Washington DC face a problem. The memorials are spread out over a large area and seeing them all is quite a task even for those accustomed to walking long distances. The solution is to take a private tour of the memorials with Nonpartisan Pedicab. 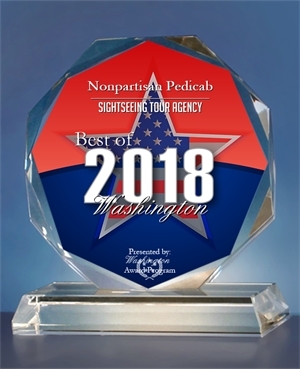 With Nonpartisan Pedicab, we can stop very close to every memorial, much closer than you can get with a bus tour or even with handicapped parking tags. We can pick you up from any downtown location of your choice — right from the door. When your tour is finished, we can drop you off at any downtown location. It is easy to get in and out of a pedicab. We can get right up to the curb, and our pedicabs are equipped with a step and a handlebar for easy access. Most guests tell us that it is easier to get in and out of a pedicab than a car. Further, we are always happy to assist you to get in and out of the pedicab. If you use a wheelchair, we can even walk you through each memorial. 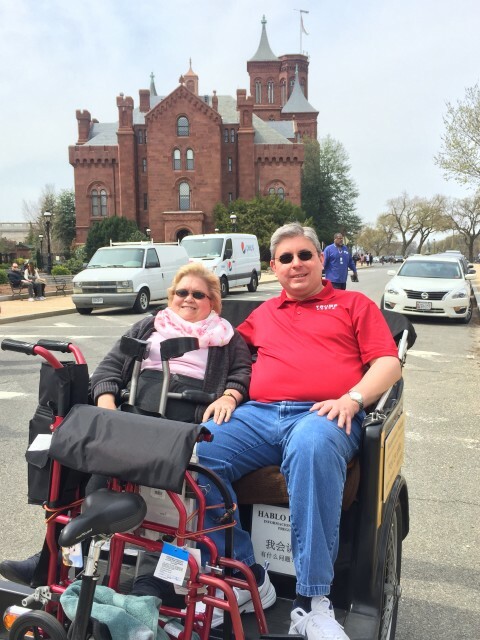 How does Nonpartisan Pedicab provide accessibility for disabled or handicapped visitors to Washington DC? Start your tour with a free pick up from any downtown location — hotels, restaurants, museums, parking garages, Metro stations. We can get closer to the memorials than any other form of transportation. We get much closer to each memorial than a bus tour will take you, and we even get much closer than the handicapped parking spaces that are provided. It is easy to get in and out of a pedicab. We get right up to the curb, and there is a step attached to the pedicab. There is also a handlebar to grab onto. Furthermore, we are always happy to assist you getting in and out at each location. 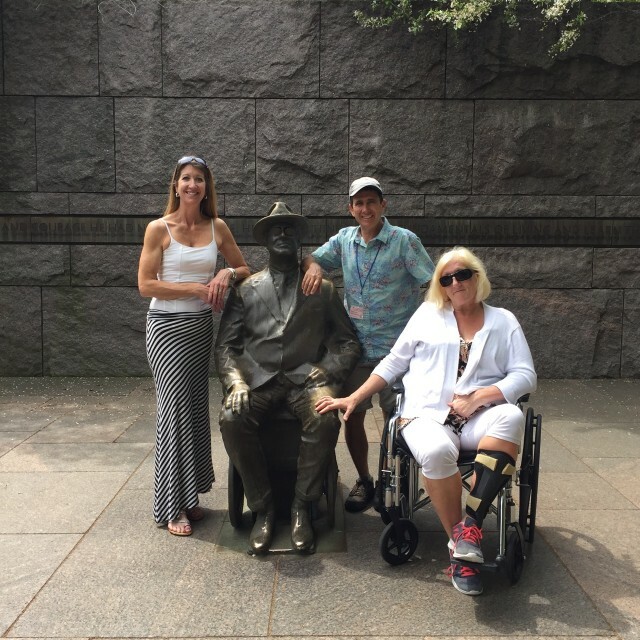 We are always happy to personally guide a wheelchair into the monuments. 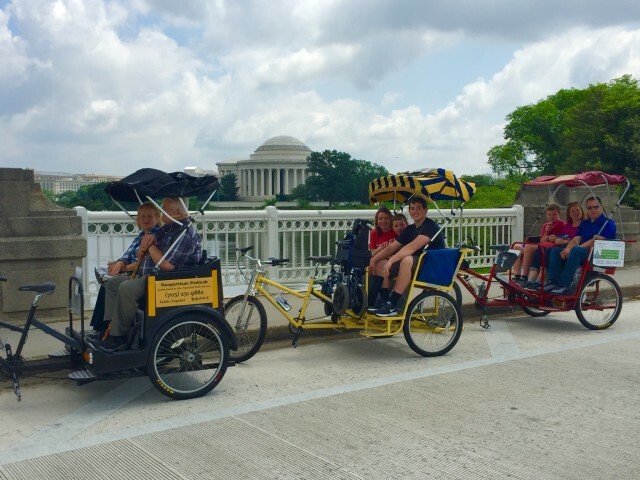 What are the advantages that a Nonpartisan Pedicab tour has over a bus tour? On a bus tour, you must always deal with getting up and down steps, particularly if it is a double decker bus. With Nonpartisan Pedicab, there are no steps since we can get right up to the curb. The bus tour stops at a distance from each memorial, and you must walk much further for access into each. With Nonpartisan Pedicab, we stop as close to each memorial as possible. There are dedicated pedicab stands right next to each major memorial. The bus tour is impersonal, with the tour guide making announcements over a loudspeaker to the entire group. 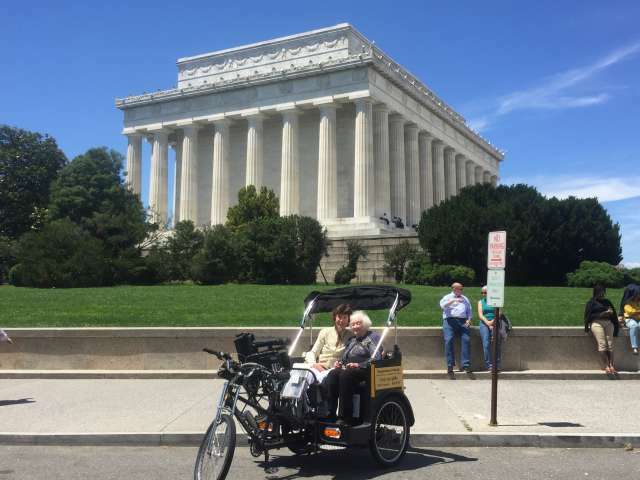 Nonpartisan Pedicab offers private tours, and your tour guide speaks to you directly. We are happy to answer any question you might have about US History, architecture and the history of the city of Washington DC. A bus tour requires you to wait for the next available bus after each stop. With Nonpartisan Pedicab, we are always waiting for you after each of your stops. We go on your own schedule and at your own pace. On a bus tour, there are fixed points to start and end your tour. With Nonpartisan Pedicab, we pick you up and drop you off at any downtown location of your choice. COULDN’T HAVE HAD A BETTER EXPERIENCE SEEING D.C.!!! I am a full-time wheelchair user, so accessibility was a priority! I was unable to find exactly what I wanted for my husband and I to really experience D.C. in a do-able way! UNTIL my search “landed” on Nonpartisan Pedicab! . . . My chair folded and stored easily and off we went! Oh my goodness, there aren’t enough words to express what a terrific 3 1/2 hours we had as Alex pedaled and talked (didn’t even breathe heavy up and down, in and around the hills and streets)! We saw all the monuments, the memorials and the offices/museums that comprise the National Mall and a bit beyond! If we wanted to get out and see things closer, Alex unloaded my chair, waited for us and we resumed the tour! 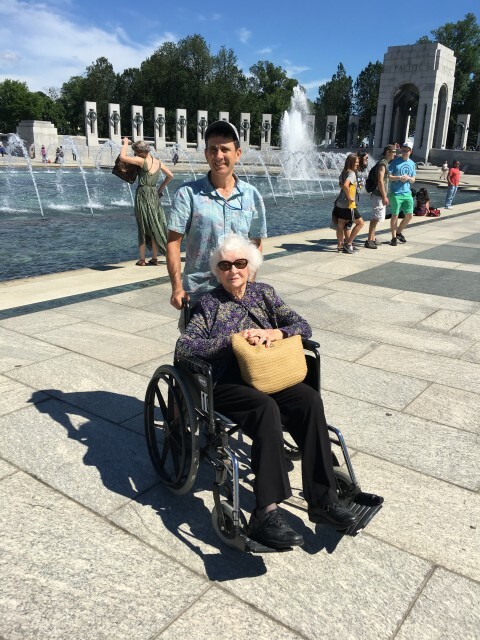 Robert met my 100 year old mother & me at Union Station, strapped on her wheelchair & took us on a fabulous tour of the mall. He has pictures of how things looked in Washington DC years ago before the Memorials were built. His knowledge of the history of D.C. is vast! All this and he’s so enthusiastic & helpful! This is a must-do tour for anyone and for someone who is disabled, it’s the only way to go. What a way to see our Nation’s Capitol!! I am disabled, and use a wheelchair to get around for any distance. I had researched how to sightsee in DC for the disabled, and somewhere Nonpartisan pedicab popped up. I had not even thought of this as an option until I looked at his website and read the reviews posted there. After then looking at several other options, I returned and sent Robert (owner) an email. He called me right away and assured me he would be able to meet our needs. How right he was! He picked us up at the historic Wilard Hotel and spent the next six hours showing us his city. He was very knowledgeable and personable and energetic. His supplemental information about all things DC gave us insight that you don’t get in the history books. We were able to go at our own pace and I forgot I was handicapped for a while. It would be safe to say, his tour was the highlight of our trip. It was perfect for our first day and gave us a lay of the land. 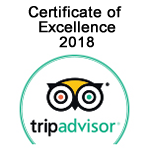 Very worth the cost and I would recommend anyone that wants a personal and fun history lesson and tour to book with Robert. So impressed!! 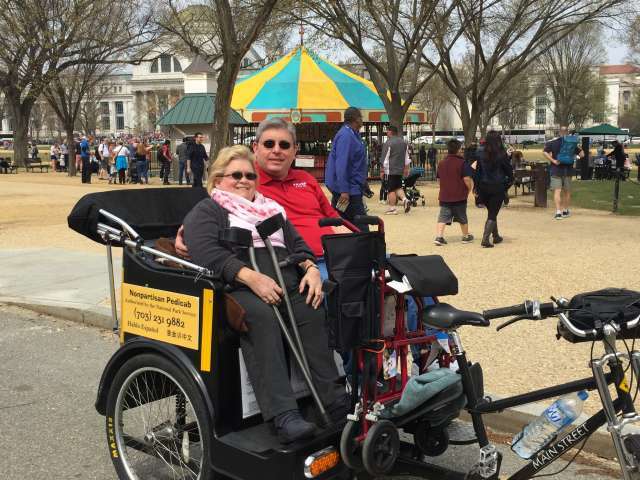 . . .My husband has MS and has a hard time with walking long distances and after researching tours and finding Nonpartisian Pedicab, I knew it would be a great option for us. Robert and Alex were our guides. . . Both guides were very knowledgable and also did a great explaining the history in a way that three kids could understand. I would highly recommend them for any family with mobility issues. 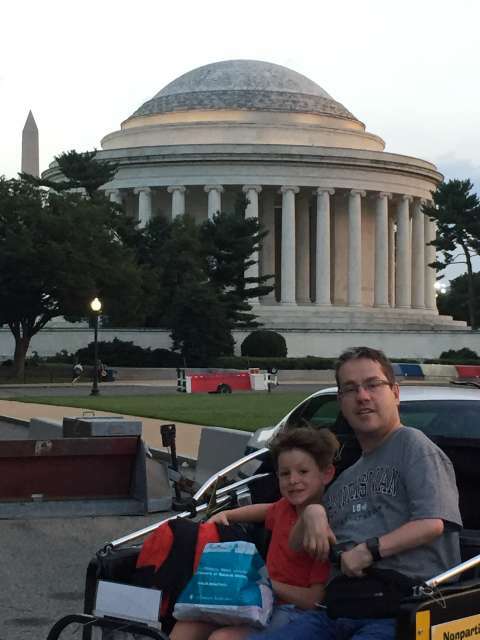 My husband has mobility issues (won’t even do a bus) so this was the option I came up with for him to see the National Mall and I’m glad I did! It started with being picked up at our hotel front door and just continued to go up from there. Robert was amazing. He is a wealth of information and his visual aids were an added plus. How he rode us from one end of the mall to the other in that heat still amazes me. I like taking lots of pictures so while I took pictures of every monument and building that you can think of ( along the Mall)my husband stayed on the pedicab and talked to Rob. Thanks Rob for making it a day we will both remember forever and catering to both our interests. Money well spent and would suggest anyone to consider this as it is a very personable and personalized way of seeing The Nation Mall. BEST TOUR IN DC!!! . . .WORTH EVERY PENNY! There were 3 of us ladies including my Mom who was using a walker. We were concerned about the walking she would have to do from tour bus stops to get up to the monuments. So, based on yelp reviews, we decided to splurge on a pedicab. BEST decision of our trip. . . . He popped Mom’s walker up on the pedicab and off we went. He took it off and on at every stop! . . . Not only did he save us SOOO much walking by getting right up to the entrance of each stop, he told us so much more than the big tours. . . . So much extra information! . . . Can not recommend this highly enough! Robert, the Mom, daughter and daughter in law from Texas say EXCELLENT JOB!